Bus from Johor Bahru to Ipoh is one of the cheapest and most convenient transportation options to travel to Ipoh for well-known Ipoh Dim Sum, Old Town Coffee and Bean Sprout Chicken. Why take the bus from Johor Bahru to Ipoh? While flight service is available from Johor Bahru to Ipoh, flight fare can often be more costly than bus fare, usually in the range of RM 100 – RM 300 unless there is a special promotion. Train service is also available; however, because of the longer duration required to travel from Johor Bahru to Ipoh, taking a train is not always the travellers’ choice. Another reason to take bus from Johor Bahru to Ipoh is that travellers can always take a night bus from Johor Bahru to Ipoh. By the time you wake up in the morning, you will find yourself in Ipoh. Therefore, travelling by a night bus from Johor Bahru to Ipoh saves time for travellers. City Holidays, Konsortium, S&S International, KKKL, Starmart, Kejora Masyhur, Seasons, Sin Yong Express, and JB Transliner are the few coach companies providing bus from Johor Bahru to Ipoh. The journey duration is about 7-8 hours depending on traffic conditions. The bus fare is in the range of RM 53.60 – RM 75.00, depending on the choice of bus companies. All the coaches for Johor Bahru to Ipoh are at least 27 seater spacious VIP coaches with air conditioning. Therefore, travellers do not need to worry about the comfort level in the coach during the journey. Most buses going to Ipoh from Johor Bahru are departing from Johor Larkin Sentral Bus Terminal. Some coaches will also pick up other passengers at Tun Aminah Bus Terminal, Johor Jaya Bus Terminal, KFC Petronas Jalan Skudai, and Merlin Tower Johor before heading to Ipoh. Both Tun Aminah Bus Terminal and Johor Jaya Bus Terminal are two smaller bus stations in Johor Bahru. As for arrival point, most of the time the coach will alight some passengers along the journey at places like Bidor, Tapah, Kampar, and Gopeng, before terminating at Aman Jaya Bus Terminal (new bus terminal in Ipoh north, further away from Ipoh city centre). Some coach operators will drop off passengers near Medan Gopeng area, which is the Ipoh City Centre. Please note that Aman Jaya Bus Terminal is 10-15 minutes driving distance away from Ipoh city centre. 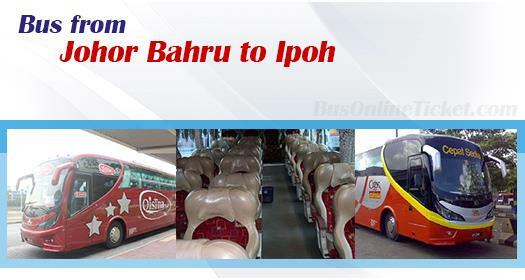 Travellers are advised to book Johor Bahru to Ipoh bus ticket online in BusOnlineTicket.com in advance due to limited trips per day for bus from Johor Bahru to Ipoh. It gives you peace of mind that you have everything in place before you travel. Booking your Johor Bahru to Ipoh bus ticket with reputable bus portal BusOnlineTicket.com is secured and convenient. Besides that, online booking also help you to avoid the queue and parking problem in a bus terminal.